I’m always up for a new adventure, and throughout my life, I’ve tried out all kinds of sports and recreational activities. It wasn’t until six years ago that I skied for the first time, and I’ve been hooked ever since. I grew up in Atlanta and knew that Shepherd Center organized ski trips for people with disabilities. It took me a while to be settled enough in my career to take a big trip since there’s not much skiing in the southeast, but I eventually took the plunge. I recently got back from my sixth time skiing, and each time I go, I can’t wait to get back. 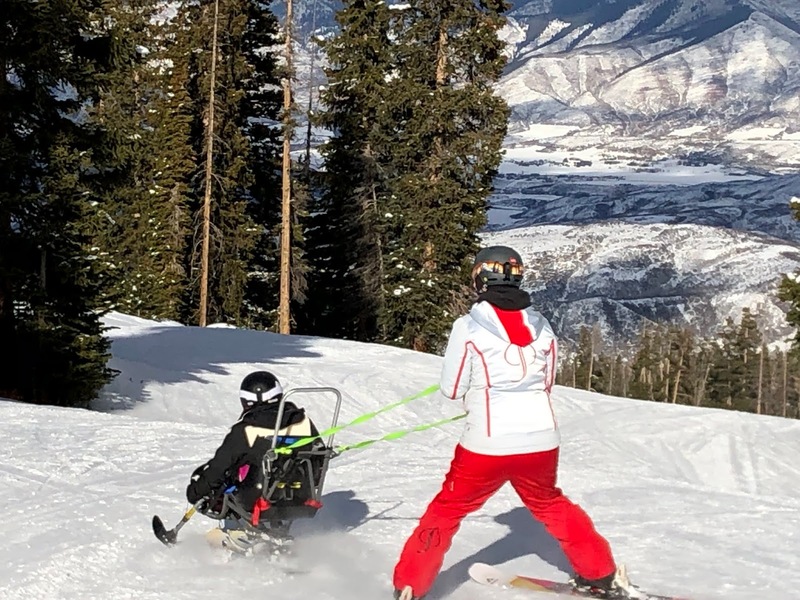 If you don’t know much about adaptive skiing, the first thing to know is that there is a way for everyone to ski. 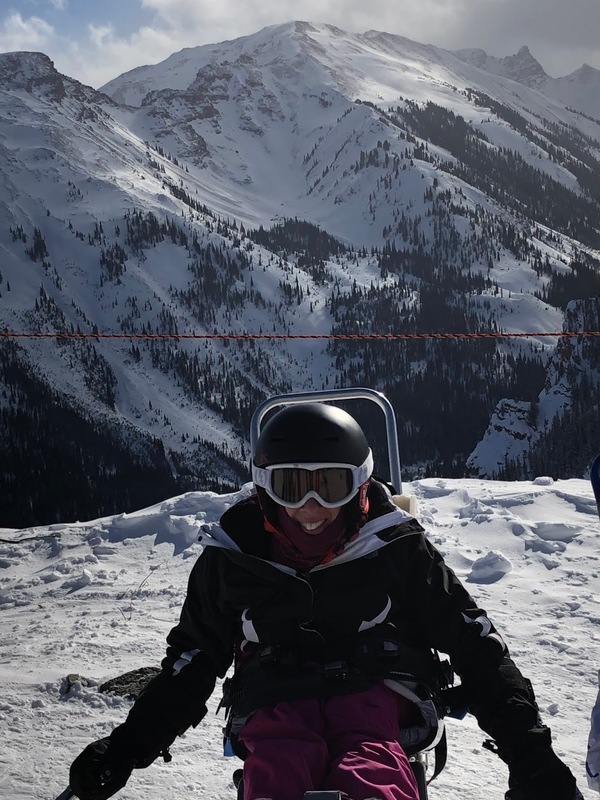 For people who ski sitting down, there are mono-skis, which have one ski below where you’re seated and are for people with good balance, and bi-skis, with two skis below you for more stability. Most of the time, you also have outriggers, the top part like a crutch and the bottom like a ski, which help with turns and balance. You can hold outriggers in your hands or they can be fixed to your ski if you don’t have the grip strength to hold them. You can also ski with assistance without any outriggers at all. Also, when you’re first learning and for as long as you need it, you can be tethered to your instructor, which enables he or she, to help you make turns and, most importantly, control your speed. Many ski resorts, even small ones, have adaptive programs. I’ve been fortunate to ski with some larger programs in Colorado and Utah, but even in states where you might not expect there to be snow or mountains, you just might find somewhere to ski. Any day on the mountain is a good day, so take the chance to try it at a smaller resort if that’s close to you. 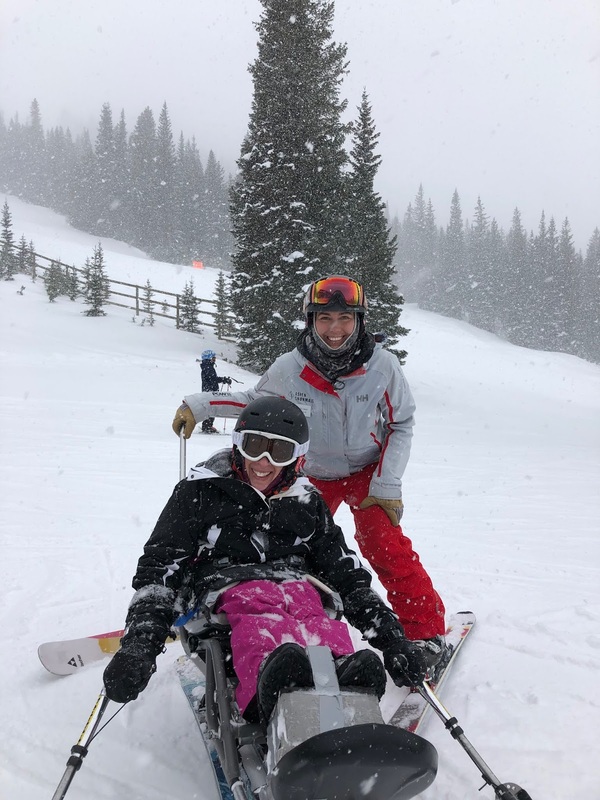 As part of adaptive programs, they take time to get to know your ability, to fit you for the right equipment, and to get to know your goals, and then you’re matched with an instructor to help you learn and meet those goals. 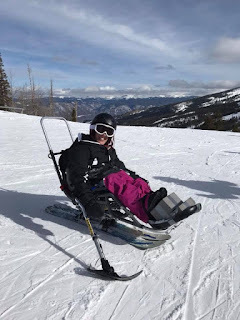 I’ve skied with three different adaptive programs, the National Ability Center in Park City, UT, The National Sports Center For The Disabled in Winter Park, CO, and, where I’ve been the last three times I’ve skied, Challenge Aspen in Aspen, CO. Warmth is often a concern for new adaptive skiers. I’m a Southerner, warm-weather girl normally, but getting to ski is different. Depending on where and what time of year you ski, you do have to pay attention to the kinds of fabrics you wear to keep you warm. However, especially if you’re going to control your own outriggers, remember that skiing can be hard work, and, as a result, you do warm up. There are lots of great guides for what to wear if you search online. As for my own skiing experiences, I started out in a mono-ski the first time that I skied. I went into skiing knowing that I didn’t have the best balance, but other people on my trip were in mono-skis, so when it was suggested to me, I gave it a whirl. It was definitely a challenge! I was fighting my balance the whole time to stay up, but, honestly, I went into it with low expectations, so I was pretty happy that I stayed up at all. On my first trip, I also learned how important it was to jive with your instructor. From what I gathered, my instructor was more used to working with standing skiers with other types of disabilities and with people at a more advanced level of skiing than me. I’ve absolutely loved all of my other instructors who I’ve had over the years and know my first instructor pairing was just a fluke, but it was all so new to me that I was still able to take it all in and have fun. The second time that I went skiing somewhere different, I told my instructor about my first experience, how the mono-ski was hard for me with my balance but that I wasn’t quite sure if it was more of an issue with my instructor or if the mono-ski wasn’t really for me. We talked about it, and he asked me if I’d be willing to give the mono-ski another try, and if we wanted to switch to the bi-ski the next day, we could. That sounded like a good plan to me, so we set off for a day with the mono-ski. This instructor was much more my style. After a fun day, he helped me see that I might not be so bad at skiing after all. He said, “You can balance. If you lived here, I could teach you to mono-ski. It would take a while because you’re always going to be fighting your balance. If you only ski once a year, I think you’d enjoy the bi-ski more because you could ski without having to worry so much about balance.” So, the next day, I skied in a bi-ski, and I’ve been doing that ever since. While I am adventurous and jump at the chance to try new things, I’ve also had enough medical setbacks and precautions, especially as a kid, that even now as a strong adult, it takes some time and reassurance for me to learn new physical skills while I’m building up my confidence. That’s definitely true for me in skiing. There are lots of people who have been skiing for less time than me and are past where I’ve progressed to, but I also know that I’ve built up a tremendous amount of confidence over the years through skiing. I’ve come a long way! Things that were way out of my comfort zone when I first started skiing now don’t seem so difficult or scary. On the other hand, there are still parts of skiing that are way out of my comfort zone, but that’s one of the fun parts about skiing, always learning and challenging your own abilities. I often find that the confidence I’ve built in skiing translates into other areas of my life. After I come back from a ski trip, I often find myself thinking of new things that I want to accomplish, and when challenges arise, I’ll sometimes remind myself, “You’ve skied down a mountain. This isn’t that hard.” It’s funny how a little perspective makes new challenges easier. When you spend most of your life 4 feet off the ground, being on top of a mountain is a pretty incredible feeling. The scenery as you ski and the feeling of having made it down the mountain are pretty awesome, too. It’s something that words don’t always do the proper justice, so take some time to head over to the slopes and experience it for yourself. Columnist Amy Saffell lives in Nashville, TN and is the Executive Director of ABLE Youth, a nonprofit that helps kids with physical disabilities learn to be independent focusing adaptive sports. She enjoys participating in races anywhere from 5Ks to half marathons, climbing, spending time with friends and family, concerts, and finding new adventures.